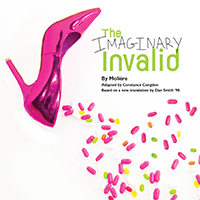 Notre Dame’s Department of Film, Television, and Theatre (FTT) announces Molière’s The Imaginary Invalid, adapted by Constance Congdon from a new translation by Notre Dame alumnus Dan Smith (’98), in the Patricia George Decio Theatre at the DeBartolo Performing Arts Center, November 14-18. FTT is pleased to welcome translator Dan Smith (’98) back to campus for the production. Currently Assistant Professor of Theatre Studies at Michigan State University, Smith is a dramaturg and theatre historian with research interests in 17th and 18th century French theatre, history of sexuality, and translation studies. He will meet with the cast and visit several classes in FTT and the Department of Romance Languages to speak about the process of translation. Student $7, Faculty/Staff/Senior (65+) $12, General $15. Additional discounts available for groups of 10 or more. Tickets may be purchased online at http://performingarts.nd.edu, by phone at 574-631-2800, or in person at the DeBartolo Performing Arts Center ticket office. Ticket office hours are Monday­-Friday, 12:00-6:00 pm. Originally published by Stacey Stewart at ftt.nd.edu on October 30, 2018.